Route: At the former village restaurant of Groß Fredenwalde follow the paving path towards the vineyard (road marking Yellow Line), after approx. 500 m to the right of the path ascent to the vineyard, back to the path and the Sand road ca. 2.5 km follow the asphalt road, turn right on the asphalt road and walk through the village of Willmine (Yellow Line), at the village exit Willmine to the left on the paving path towards Arnimswalde Abiegen (Yellow Line), after approx. 500 m to the left of the path on the narrow path climb the Spitzberg, after descent on the pavement continue until after Arnimswalde, leave in Arnimswalde path with yellow bar mark and turn right between the two field houses, after approx. 400 m you come across a sandy path, go right there and walk to Bökenberg, turn right in Bökenberg and walk along the asphalt road up to the small peace forest, on the paving road up to asphalt road, there turn left to large Fredenwalde. The "Wallpfad" goes in the middle of the Fredenwalde. It is a tourist project that was implemented in the Uckermark in the year 2005. The CA. 70 kilometers long Wallpfad can be travelled on foot or by bicycle, passing through numerous historical sites of the Uckermark and roaming different cultural eras. The Wallpfad leads through the Uckerseeregion (Oberuckersee and Unteruckersee), past Slavic castle ramparts. 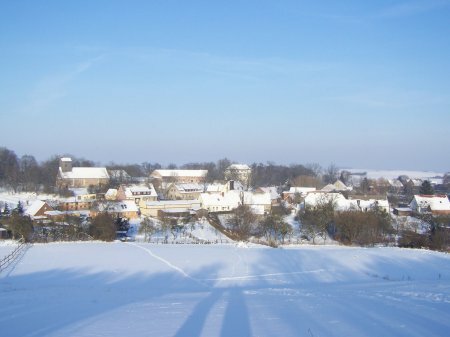 The route leads from Warnitz (church, 1738 built) over the mountain of the room (stone box), further to Blankenburg (Wallberg of a former Slav castle), Seventies (former monastery site), Potzlow (Market Square, Rolandfigur and Church), Strehlow (church ruins, findling), Röpersdorf (Church), Sternhagen (Church), the/Five Lakes View/(Phallus stone), Fergitz (Castle Wall Island, demon Stones in church, former watermill), either via Kaakstedt, Gerswalde, Friedens, Berkenlatten, Böckenberg, Klein Fredenwalde, Groß-Fredenwalde to Stegelitz to Warnitz or via Flieth (Church Ruins), Vossberg (tumulus on the Pechberg), Suckow (Ice cellar, Erbgräber of those of Arnim), Stegelitz (church) to Melzow (Old Forge, building 1898 built and church with organ, 1859 by Wilhelm Lang and Ferdinand Dinse built).